Seasonal advertising is common for very good reason. Aligning your promotions with time-sensitive annual events creates a distinct sense of urgency that your products might otherwise lack. Many consumers have become habitual spenders during these specific times of the year, and if you haven’t positioned your products as part of the cyclical festivities, you’re likely losing revenue to your competitors, who didn’t have to come up with deep discounts or inventive marketing to best you. Let’s not let that happen. 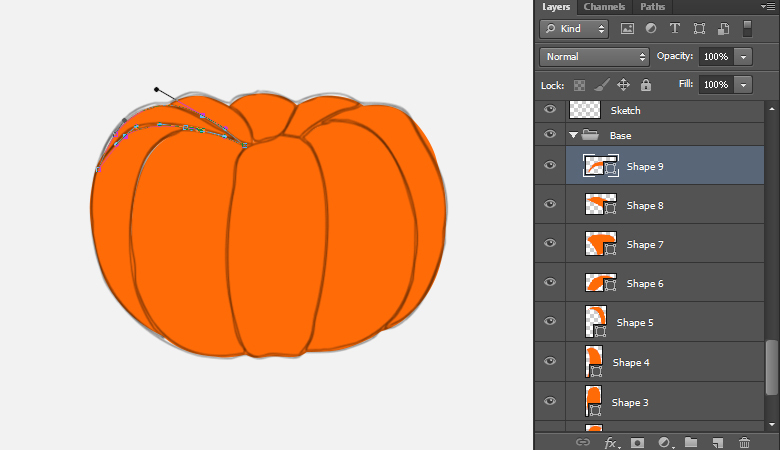 In this tutorial, I’ll walk you through the process of crafting a perfect way to align your products with the holidays — a Halloween pumpkin. We’ll use the pen tool, the brush tool, shape tools, and various options within the filter and edit menus to achieve the final result. Hopefully, you will learn few handy tips along the way. So, let’s get started! Now, we’ll trace it using the pen tool (“P”). Pick #ff6b07 as your Fill color and select the pen tool (“P”); make sure to choose “Shape” as your tool mode within the top control bar. 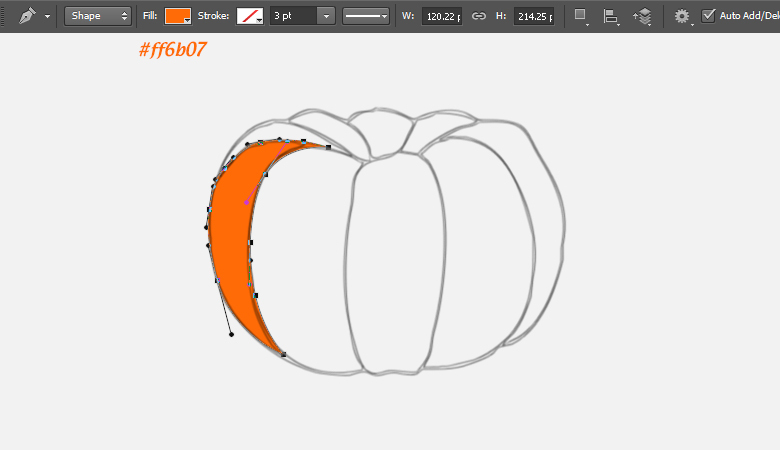 Start drawing one of the pumpkin parts on a layer below your sketch. Draw each part on separate new layers. Once you are done, select them by holding the “Shift” key and pressing Ctrl + “G” to collect them into a group. Label the group as “Base”. Hide or delete the sketch layer. 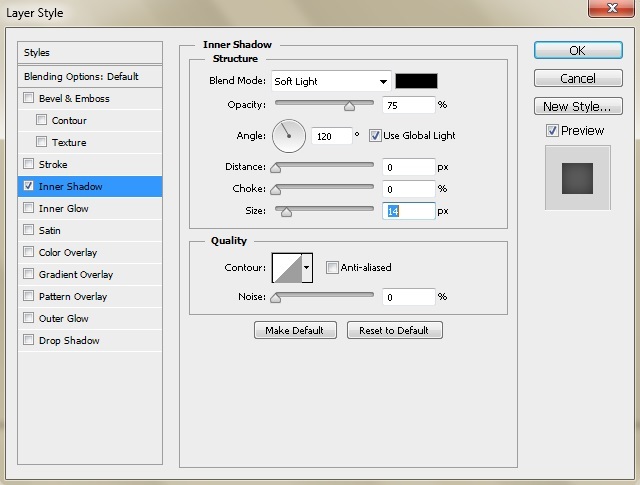 Now, double-click one of the shape layers to view the”Layer styles” window and apply the following settings for “Inner Shadow”. Now, right-click this layer and select the “Copy Layer Style” option. After that, right-click on the rest of the shapes one by one and select “Paste Layer Style” from the options to apply the same inner shadow settings to them. 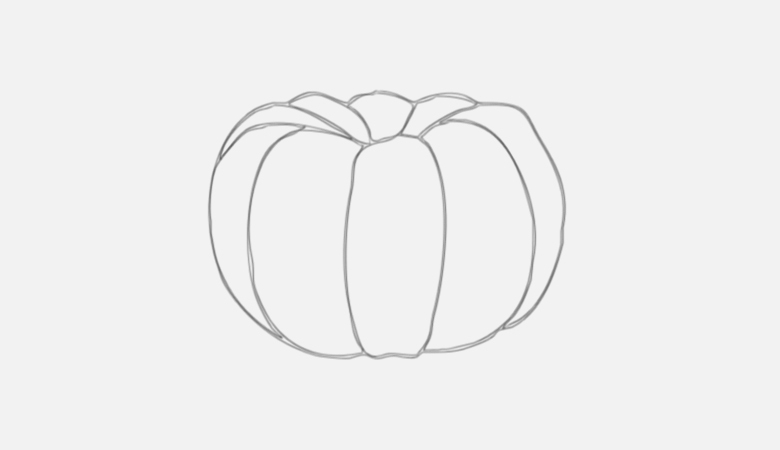 Next, we’ll apply some shading to make our pumpkin realistic and interesting. Press Ctrl + to make a selection around it. Now, create a new layer just above it by clicking the “Create a new layer” icon within the layers panel. 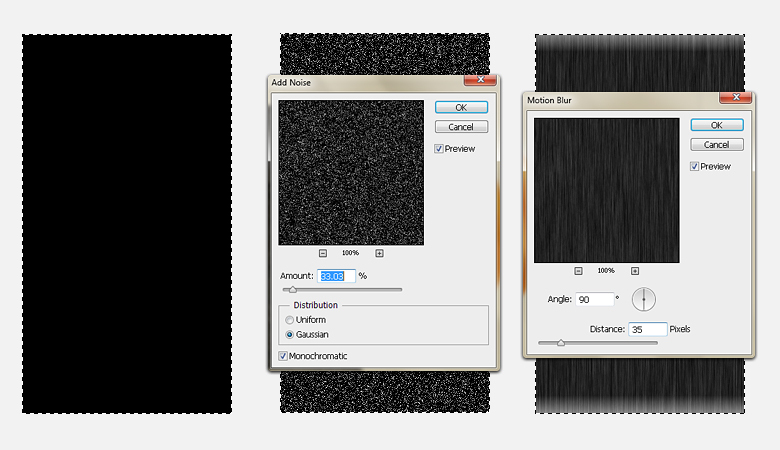 For the shading, we will use “Soft Round Brush Tools” of varying sizes between 12px and 30px. Now, make a few approximate highlights on this new layer within your selection using #fada52 as your fill color. For the shading, use color #d14e00. Label this new layer “Shading”. Click the newly-created shading layer and go to “Filter” > “Blur” > “Motion Blur” and apply the following settings here. 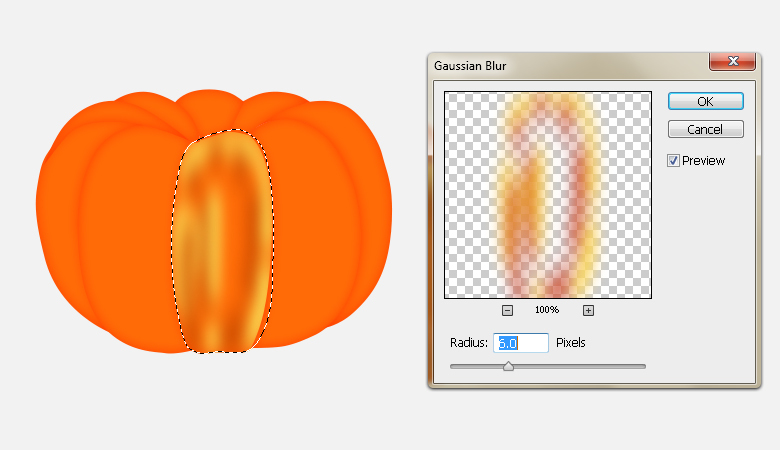 After that, go to “Filter” > “Blur” > “Gaussian Blur” and apply a 5-6px Gaussian blur effect to blur the shading properly. Now change its blending mode to “Screen” and adjust its opacity to 50-70%. 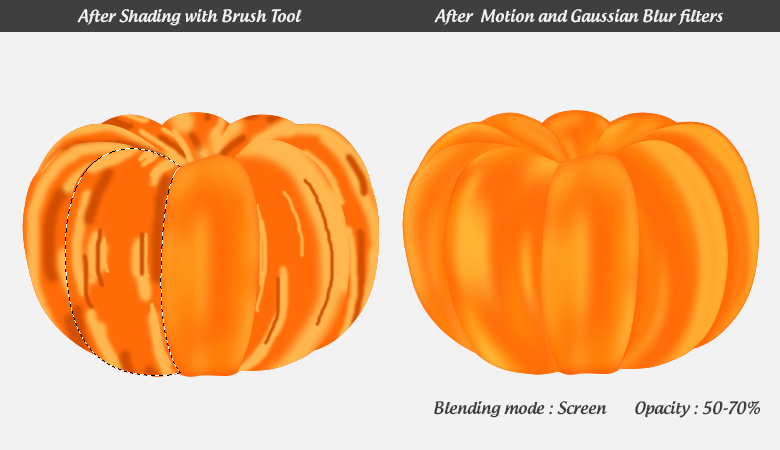 Use the same techniques explained in steps 5-6 to apply shading to the rest of the pumpkin parts one by one. 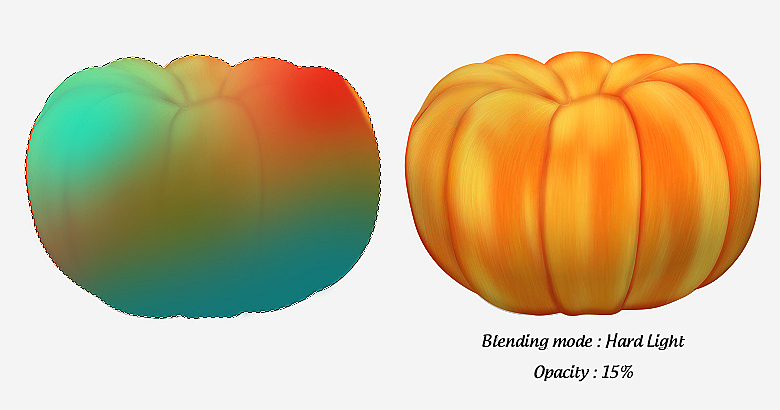 Change the blending mode of all the shading layers to “Screen” with opacity set between 50-70%. An alternate technique to blend the shading is achieved with the smudge tool, which you can view under the blur tool within the tool bar. Pick the smudge tool and choose a 100px soft round brush with a 15-25px Strength from the top control bar and blend the strokes gently within the selected area. 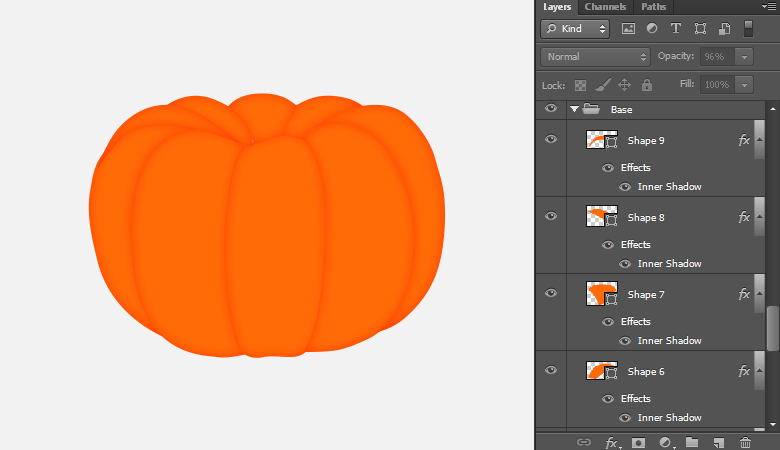 Next, we’ll add texture to our pumpkin. Draw a rectangle using the rectangular marquee tool on a new layer. Fill it with black using the paint bucket tool and go to “Filter” > “Noise” > “Add Noise” and apply the following settings to add noise. After that, apply the provided settings for “Motion Blur”. Label this new layer as as “Texture” and duplicate it 2-3 times. 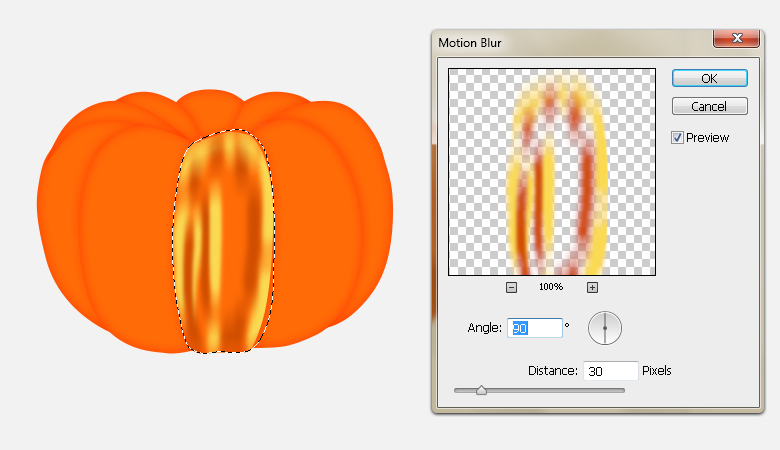 Now take a texture layer, change its blending mode to “Linear Dodge” with a 30-40% opacity, and position it over the left side of pumpkin. 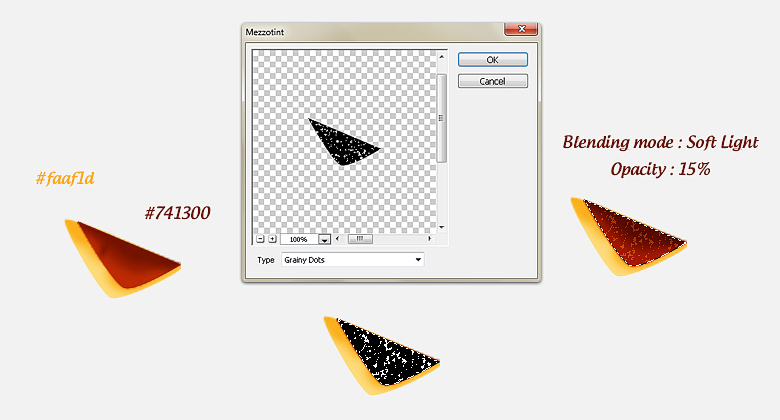 Now, go to “Edit” > “Transform” > “Warp” and manipulate the tool to arrange the texture in a curve as shown below. 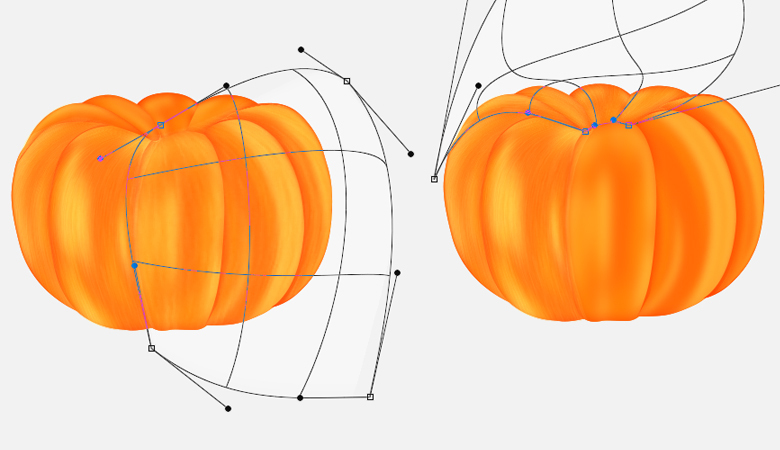 To confine the texture within the pumpkin, we’ll apply a layer mask to it. Duplicate the base layer and merge it. 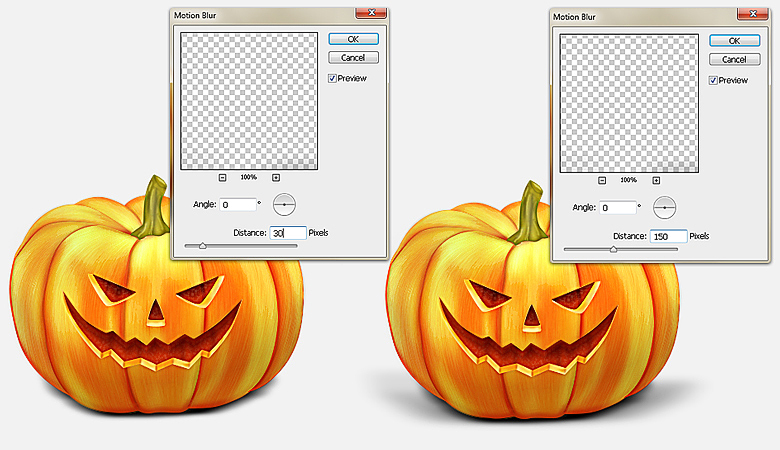 Now, click on the texture layer, press Ctrl + to select the pumpkin area, and click on the icon to “Add Layer Mask” present at the bottom of layers panel. 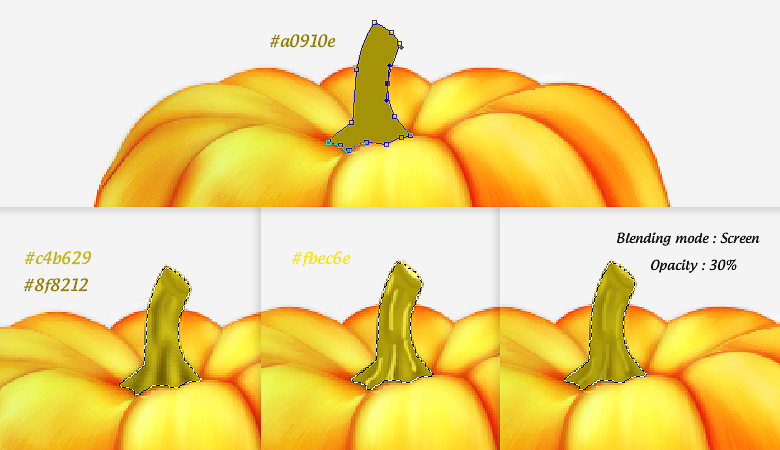 Now, take a copy of the texture (Blending mode: “Linear Dodge”, Opacity: 30-40%), position it over the right side of pumpkin, and curve it using the warp tool. 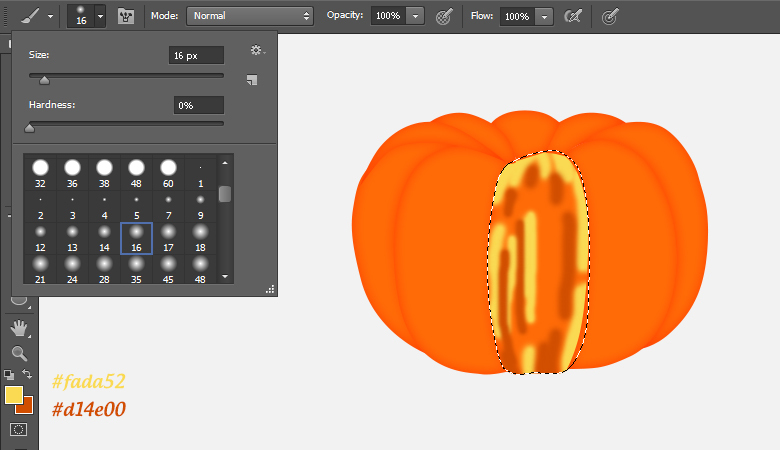 Similarly, modify the texture for the top portion of the pumpkin. 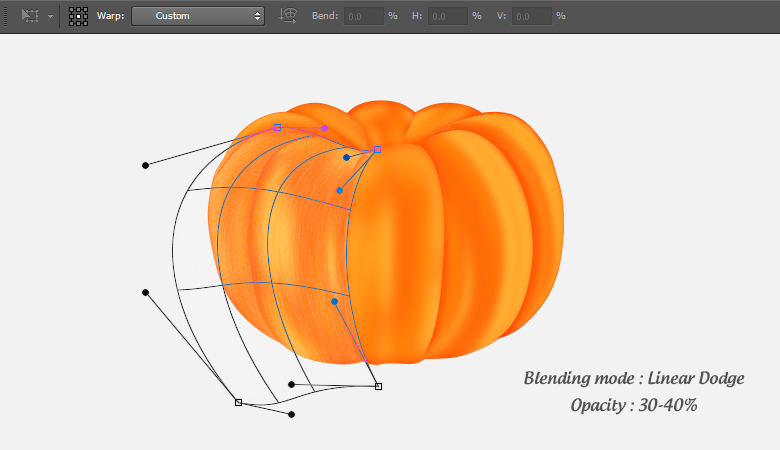 Create a new layer, pick a 4-5px soft round brush tool with 30% opacity, and apply it on this new layer at the junction of various pumpkin parts. After that, apply a 2px Gaussian blur filter to it. Duplicate it, change the blending mode of original layer to “Overlay” with a 100% opacity, and change the blending mode of the duplicated layer to “Multiply” with a 30% opacity. 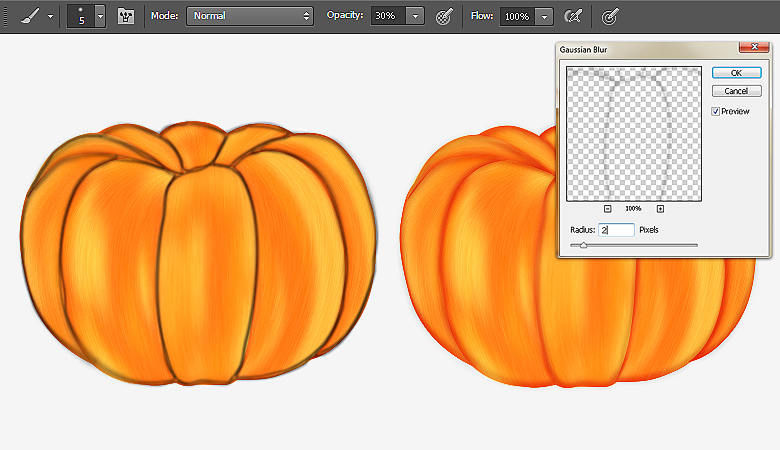 Now, we’ll apply even more shading over the pumpkin. 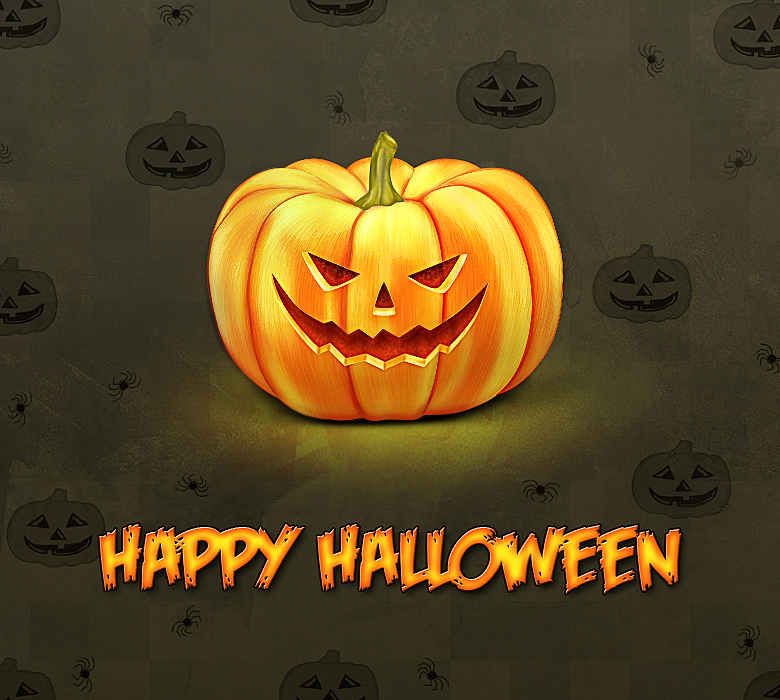 Press Ctrl + to make selection around the pumpkin. Create a new layer and make highlights on the top using a 35px soft round brush tool with #fddd4c as your selected color. Change its blending mode to “Overlay” with a 70% opacity. Create another layer and apply a soft round brush over the bottom part with black as your fill color. 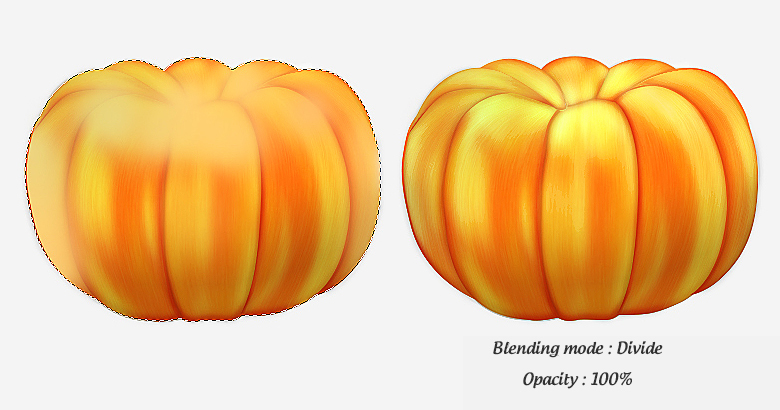 Change its blending mode to “Multiply” with a 30% opacity. Bring the “Base copy” layer above the rest of the layers, and change its blending mode to “Hard Light” with a 35% opacity. Press Ctrl + to make selection around it. Now, create a new layer and apply a soft round brush tool within the selection in shades of green and red. 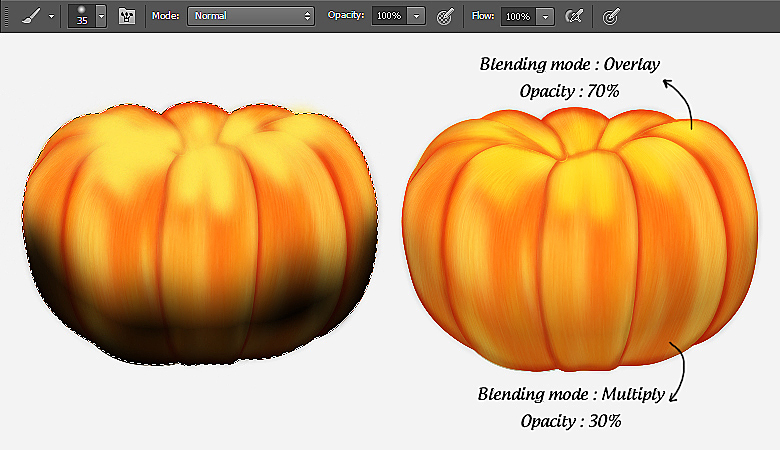 Change its blending mode to “Hard Light” with a 15% opacity. Now, pick #ffca6c as your color and apply a soft round brush on a new layer as shown below. Change its blending mode to “Divide” with 100% opacity. 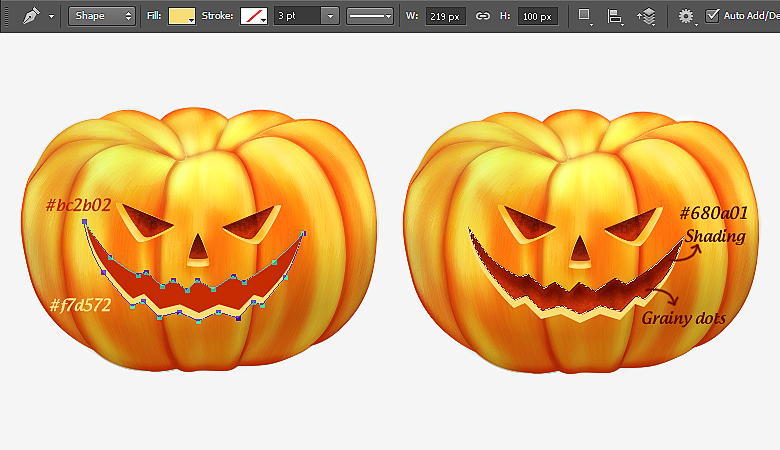 Next, we’ll draw the pumpkin’s carved eyes. Select the pen tool (Tool mode: Shape) to draw two triangular shape as shown below. Label these shapes as “outer” and “inner eye”. Press Ctrl + to select it and apply shading using the soft round brush tool with #fab01d as your chosen color on a new layer. After that, apply shading over the “inner eye” using color #741300. While the inner eye selection is active, create a new layer, fill it with black color, and go to “Filter” > “Pixelate” > “Mezzotint” and choose “Grainy Dots”. Change its blending mode to “Soft Light” with a 15% opacity. Collect the eye layers into a single group, duplicate it, and flip it horizontally by going to “Edit” > “Transform” > “Flip Horizontal”. Position it over the right side as shown below. Also, make pumpkin’s nose using the same techniques. To make the mouth, draw the following two shapes. Label them as “outer” and “inner mouth”. Press Ctrl + to make selection around it, apply shading on its top edge within a new layer, and give it a grainy dots texture, as we did over the eyes. Now, press Ctrl + to select that area and apply shading on a new layer as shown below. 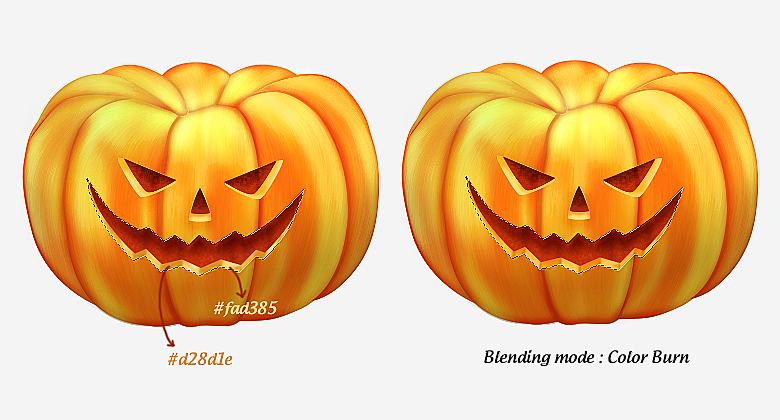 Change shading layer blending mode to “Color Burn”. 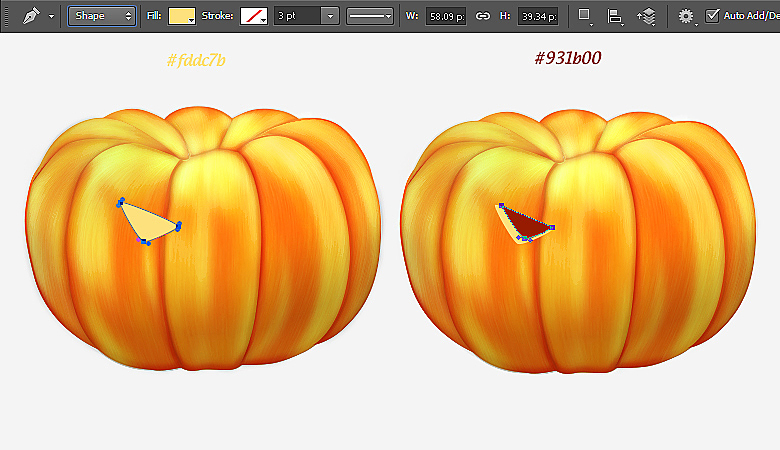 To make the pumpkin stem, draw the following shape using the pen tool (Tool mode: Shape) with #a0910e as your color. 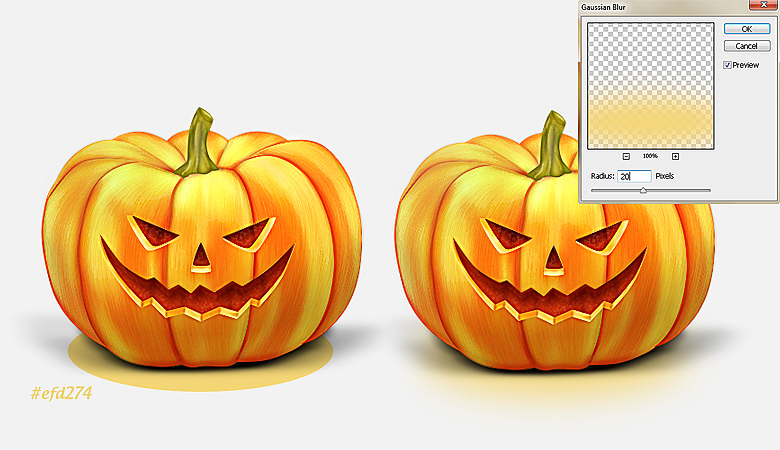 Apply some shading over it using a soft round brush tool with the following two colors. Create yellow highlights with a 1px hard round brush tool; change its blending mode to “Screen” with a 30% opacity. 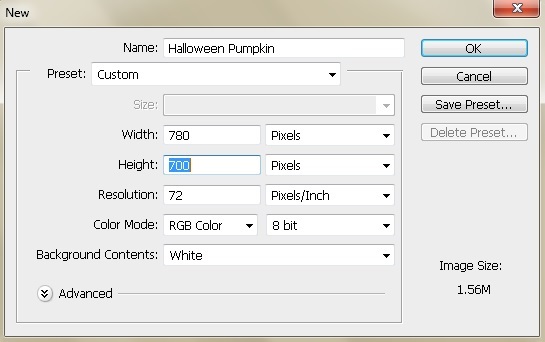 To sharpen all the details, collect all of the layers into a single group and label it as “Pumpkin”. Duplicate this new layer, merge it, and go to “Filter” > “Other” > “High Pass”. Apply a 2px high pass effect on it. Change its blending mode to “Linear Dodge” with a 75% opacity. Next, we’ll make pumpkin’s shadow. 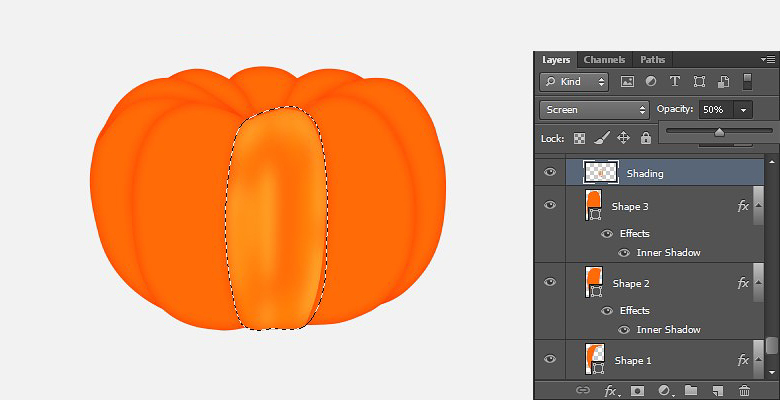 Create a new layer just above the background and apply a soft round brush with a size of 30px and a black fill color near the bottom of pumpkin. After that, apply a motion blur filter on it at a O degree angle and a 30px distance. Duplicate this new layer and once again apply a motion blur filter on this layer at a O degree angle and at a 150px distance. Now, we’ll make a faint glow under the pumpkin. Draw an ellipse below the rest of the layers using #efd274 as your fill color and apply a 20px Gaussian blur filter to it. Our Halloween pumpkin is ready. You can now add a suitable complementary background and the title. This article was written by Anum Khan and featured on Sitepoint.com. Don’t you just love photoshop? One of my favorite tools as a Chicago graphic designer . Illustrator is 2nd.